The travel industry was at centre stage at 41st ABAV 2013 – the biggest travel trade show, of Latin America as it took place this September in Sao Paulo, Brazil. With the upcoming FIFA World Cup 2014, the host country – Brazil was all geared up for this travel and hospitality fair and attracted a whooping 1500 participant companies from around the world. Organized by Brazilian Association of Travel Agencies, this year’s event took place at Anhembi, the largest events center in Latin America instead of Rio de Janeiro, breaking tradition. 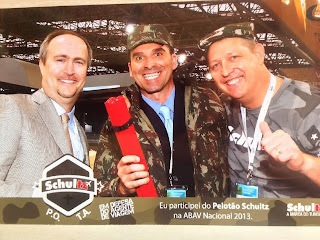 Greg Berman, COO, eRevMax and Alex Moura, Sales Manager for Brazil attended the event and met interesting industry players including Schultz who did a theme based stand. The event was an excellent opportunity to make business and build relationships with tourist trade professionals. The event focused on a large diversity of products, services and destinations offered by the travel and tourism industry, aimed to facilitate the integration between buyers and suppliers and to encourage networking. With exhibitors from over 50 countries, this year offered a series of novelties including meetings of public and private institutions and important international agreements.